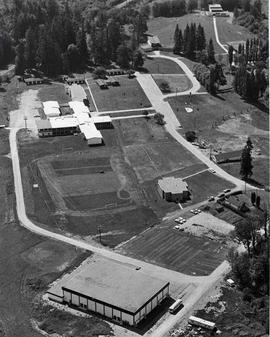 Photograph of the campus grounds taken from the northwest showing the freeway in the foreground and the David E. Enarson Gymnasium on the left; aerial photograph. 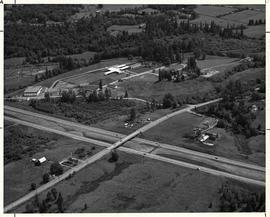 Photograph of Douglas Hall, the Barnasium, and the David E. Enarson Gymnasium taken from the south, and showing the freeway in the background; aerial photograph. Photograph of students practicing badminton in the David E. Enarson Gymnasium. Photograph of a basketball game being played in the Enarson gym. The Spartans logo is painted on the floor. Photograph of a scale model design for the gymnasium on a table. Photograph of a scale model of the gymnasium. Photograph of a scale model of the gymnasium with people in the background.